PR Seminar, which normally draws more than 160 top corporate and agency PR executives to a four-day meeting at one of the nation's finest resorts, is again embroiled in a controversy that may cut attendance. 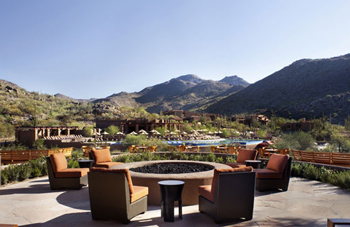 Criticism last year directed at federal bail-out recipients such as AIG that hold meetings at plush resorts resulted in a record low attendance of 127 at the Seminar meeting at the Four Season Troon, Scottsdale, Ariz. Attendance the previous year was 162. This year attendees who are booked into the Ritz-Carlton at Dove Mountain, Ariz., face embroiling top brand names in the controversy touched off by the state’s attempt to cut down on illegal immigration. Critics from many quarters, including President Obama, say the strict rules, although later slightly modified, open the state to charges of racial profiling. Johanna Schneider (pictured), executive director of external relations for the Business Roundtable, a group of CEOs from major companies, told this website she had "no comment" on the controversy when she was reached by phone yesterday. The Arizona Hotel & Lodging Association said 23 meetings have been canceled in the state and that so many are now being canceled that it stopped counting. Cities including Los Angeles, San Francisco and St. Paul have banned official travel to the state. John Budd, a member of Seminar for 15 years and on the program committee for ten years through the 1980s, said Seminarians must be aware that they could be jeopardizing famous brand names by attending the meeting. He had urged the group to meet last year in a large city such as New York or Washington, D.C., and avoid resorts. The Ritz-Carlton at Dove Mountain has a golf course designed by Jack Nicklaus. Seminarians usually meet in the third week in May but this year pushed the meeting into June when lower rates apply in Arizona. The hotel said the rooms set aside for the group were priced at $249 and have been sold out. Budd again said that meeting in another "extravagant" resort instead of a large city and barring press coverage were both "wrong." "The big value in business today is transparency and this group is violating that by its obsession with secrecy," he said. The program and copies of speeches should be available to the press, said Budd when told by this website that Seminar has yet to publicly reveal the slate of speakers. He said the group is “tone deaf” and “insensitive” to public attitudes. Seminar previously had a public website that listed members of the executive committee and other information such as the cost of registration ($3,350 per couple last year) but this year access codes are needed to gain entrance to it. Seminar members include such PR or communications executives as William Margaritis (pictured) of FedEx, president of the Arthur W. Page Society; Ray Jordan, Johnson & Johnson; Jon Iwata, IBM; Shannon Bennett, Supervalue; Paul Capelli, Staples; Thomas Downey, Boeing; Joe Evangelisti, JPMorgan Chase; Michael Fanning, Michelin North America; Thomas Forsythe, General Mills; Dan Gahlon, 3M; Susan Henderson, William Wrigley Jr. Co.; Clayton Hollis, Publix Super Markets; David Kamenetzky, Mars; John Downs, Coca-Cola; Irving Miller, Toyota; Zenia Mucha, Walt Disney Co.; Michael O’Neill, American Express; Paula Davis, Pepsi Bottling; Suzy DeFrancis, American Red Cross; Kathleen Matthews, Marriott International; David Shane, Hewlett-Packard, and Darryl Seibel, U.S. Olympic Committee. Attending in 2008 was Joseph Browne, executive VP, communications & PA, National Football League. The NFL in 1990 voted to remove the Super Bowl from Tempe, Ariz., to protest the state’s refusal to recognize Martin Luther King, Jr. as a legal holiday. Arizona in 1992 voted the day as a legal holiday and a Super Bowl was scheduled for Tempe in 1996. PR people from Bloomberg (Judith Czelusniak), Forbes (Monie Begley Feurey), New York Times (Kathy Mathis), and Thomson Reuters (Jolie Hunt) have attended Seminar but none of the media they represent have ever mentioned the existence of the group. Czelusniak (pictured), who was at Bloomberg six years and who had the title of “head of global communications,” has left the company. Bloomberg did not know if she has a new employer and said it is searching for a replacement for her. Participation by leading editors and publishers at Seminar each year, without their media ever mentioning the existence of the group, was condemned last year by a member of the Ethics Committee of the Society of Professional Journalists. Journalists should "avoid conflicts of interest, real or perceived," he told this website, saying editors of media that attend the meetings are breaking nine of the articles in the SPJ Code. Media, besides Bloomberg, that have had speakers at Seminar including the Wall Street Journal, New York Times, Washington Post, Forbes, Fortune, The Economist, Financial Times, CNBC, Fox and MSNBC.